In order to set up an SAR region, the competent authorities must, among other things, designate a maritime rescue coordination centre (MRCC). The notified SAR regions and MRCC’s are officially available on a Canadian website, but there is no entry for Libya. In fact, it is unclear how the government in Tripoli will meet the IMO requirements. For the notification of an MRCC, its staff must be able to speak English well, and sufficient means of communication and ambulance vehicles for rescue measures must be available on site. Italy is supporting Libya in setting up „fully fledged operational rooms“. However, this is not due to be completed until 2020. Until then, the task of the control centre is to be taken over by the Coast Guard in Tripoli. The application for the Libyan SAR region and the establishment of the MRCC by Italy is financed by the European Union, the Ministry of the Interior in Rome is responsible for its implementation. Under the „Support to Integrated border and migration management in Libya – First phase“ program, Italy will receive 42 million EUR from the Emergency Aid Trust Fund for Africa. An additional EUR 2 million comes from the EU Internal Security Fund, with Italy contributing a further 2 million. The program was decided a year ago, for the implementation Rome and Tripoli signed earlier this year an agreement. In the EU, the project is called „Aurora“ and is now scheduled to start in July. Allocation of responsibility between the regional Coast Guards (External Action Service). There are obvious political reasons why the sea rescue zone was declared by the IMO despite its provisional status. With an official Libyan SAR region, rescue operations in international waters off Libya would no longer been coordinated via the MRCC Rome. Italy’s Minister of the Interior and head of the „Lega“ Matteo Salvini, who now wants to expel private rescue organisations from the central Mediterranean, knows this. Malta wanted to investigate the organisation „Mission Lifeline“ because the MRCC’s orders from Rome were disregarded and refugees were taken on board, although the Libyan Coast Guard was notified to rescue them. Meanwhile, when the captain of the „Lifeline“ is facing court hearings, the allegations have been changed. According to an assessment by the research service of the German Bundestag, however, intervention in a rescue operation is not fundamentally illegal. On the contrary: the orders of a national MRCC must be admittedly complied with. However, the International Convention on maritime search and rescue says, the captain of a nearby ship is even obliged to rescue if a boat „operates with insufficient life-saving equipment or if its capacity is insufficient to accommodate persons in distress“. The German Foreign Office does not dispute these obligations of the captains involved to cooperate. SMART was modelled on EUNAVFOR ATALANTA (EUNAVFOR Somalia). The rescue organisations in the Mediterranean report that the MRCC in Rome has for some time been increasingly referring to the responsibility of emergency calls to the provisional Libyan Coast Guard. The authorities of both countries can now exchange information on sea rescue cases at several levels. 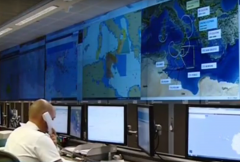 Since the beginning of the year, Libya and Italy share a common control centre in Rome. According to the daily Libya Herald, the fight against „transnational crime, human smuggling and terrorism“ is one of its areas of activity. Those involved in Rome include the Libyan Coast Guard, the „General Directorate for Combating Illegal Immigration“ (DCIM) of the Ministry of the Interior, the Libyan Attorney General and the secret services of both countries. Libya is connected to the Italian military’s SMART („Service-oriented infrastructure for MARitime Traffic tracking“) system for the exchange of information, via which unclassified messages can be distributed. Members of the Libyan coastguard were trained in the use of SMART as part of the EU military mission EUNAVFOR MED. For communication between the various authorities in the Mediterranean, the Libyan Coast Guard will also be connected to the European network „Seahorse Mediterranean“. The project has been funded by the European Commission for several years and aims to strengthen Libyan border surveillance systems. User interface of the Italian EUROSUR contact point (Ministry of Interior Italy). The Libyan Coast Guard will be networked via a satellite link with national coordination units of the EU surveillance network EUROSUR. For the Mediterranean, these are Italy, Malta, Greece, Cyprus, France, Spain and Portugal. The project is being managed by the Spanish Guardia Civil, which has launched a public tender procedure to implement the operational measures. 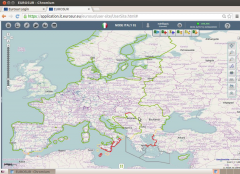 Italy has set up a „Mediterranean Border Cooperation Centre“ (MEBOCC) for „Seahorse“. All authorities responsible for border surveillance tasks, including state police, Carabinieri, Guardia di Finanza, coastguard and navy, work together there. 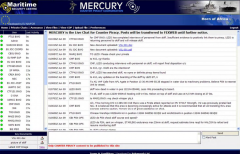 MEBOCC links up with the EU surveillance system EUROSUR. Italian Minister of Interior visits vessel „Caprera“ which supports Libyan CG in Tripoli maintainig surveillance (Matteo Salvini). 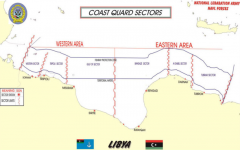 The Libyan Coast Guard and Port Security (LCGPS) benefits most from networking with Italian security authorities. It belongs to the Navy and, according to a EU document, has 3,400 employees, many of them in the cities of Tripoli, Sabratha, Misratah and Benghazi. Its tasks include water surveillance, the prosecution of smuggling or illegal fishing and sea rescue. The headquarters is located a few kilometres outside Tripoli, in the six sectors of the country there are about 50 local offices. The Coast Guard Operational Maritime Centre (CGOMC) in Tripoli will probably be the Libyan participant in the „Seahorse“ network. According to plans from last year, the Libyan MRCC could be built in the same building. The Coast Guard has at least four Coastal Patrol Vessels (CPV), that were repaired in Italy and returned in 2017. The force has also three fast boats in Sabratha, Zawia and Khoms,three smaller fibre glass boats. A large number of inflatable boats are used for patrols and sea rescue, sometimes also a patrol boat of the navy is being operated. Also, the Italian provides unknown technical support with its vessel „Caprera“ anchoring in Tripoli. The European Union, several EU Member States and the USA have been providing training and equipment for the Coast Guard for years. In 2014, training sessions were held under the EU mission EUBAM. Coast Guard members were also trained by the Spanish Guardia Civil within the framework of the „Seahorse“ network, and in three courses by the military mission EUNAVFOR MED. 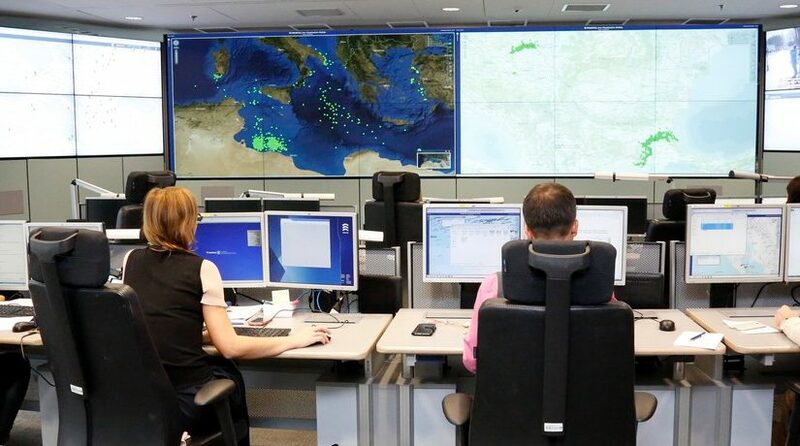 The Maritime Police is networked with Frontex through an internal Libyan working group (External Action Service). Another addressee of projects such as „Aurora“ and „Seahorses“ is the General Administration for Coastal Security (GACS), which with 3,800 members reports to the Ministry of the Interior. As Maritime Police, it also performs surveillance and sea rescue tasks, but only within the 12-mile zone at sea and in a 30 kilometre strip on the land. It is located in Tajoura, about 30 kilometres from Tripoli, and has barely no technology. The authority is a member of the „Coast Guard Cooperation Network“ (CGN) set up by the EU Border Agency Frontex, in which eight non-EU countries participate. 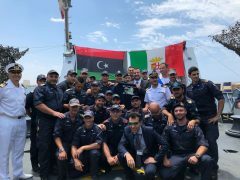 As part of the „Aurora“ project, the Italian police will train the Maritime Police, the Tunisian coastguard will provide courses in navigation. The Maritime Police have three Coastal Patrol Vessels and five Coastal Patrol Boats stationed in Tripoli and Zuwara, some of which are in Tunisia for repair. The more than 50 Maritime Stations were to be equipped with cameras and mobile and stationary radar systems, but many of them were destroyed or stolen during the civil war. In contrast to the military Coast Guard, the GACS is said to maintain relations with the eastern part of Libya. Many parts of the 1,700-long coast are not under the control of the unity government, but are de facto ruled by former army general Khalifa Haftar. Italy also intends to set up a National Coordination Centre (NCC) in the Coast Guard building and possibly the future MRCC. 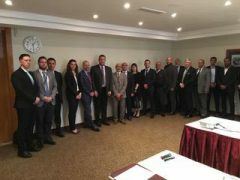 The aim is to bring together all agencies involved in border security tasks in Libya, including the authorities for oil, agriculture, transport, the environment, finance and customs. The control centre does not currently have an electronic vessel traffic management system (VTMS), all radar equipment was destroyed after the revolution. Both the NCC and the MRCC will then be connected to an Italian control centre, other EU Member States and Frontex in Warsaw. Italy now funds ten more little Coastguard boats and two ships (Guardia di Finanza). As a further measure in the „Aurora“ project, the Coast Guard fleet is to be expanded and its monitoring capacities strengthened. Italy had already repaired and returned four patrol boats, with six more to follow. This number seems to have increased. Italian Minister of the Interior Salvini announced to donate twelve additional boats, which are ten smaller coastguard boats and two ship of the Corrubia class. Finally, a fourth area of the EU 46 million EUR program aims to strengthen surveillance capabilities at the land borders with the Sahara. At 11.6 million euros, most of the project funds are spent on this matter. Since Libyan boats have repeatedly attracted attention through violent incidents and human rights violations in the Mediterranean, the Parliamentary Assembly of the Council of Europe calls in a resolution for a monitoring mechanism with sanction possibilities for the Libyan coastguard. One of the Libyan patrol boats repaired by Italy during a deadly operation on 6 November 2017 (Sea-Watch). Within the framework of the military mission EUNAVFOR MED, the European Union has now actually launched such a „Monitoring and Advising“ mechanism in which crimes committed by the Libyan Coast Guard should be dealt with. Italy is sending „Predator“ drones, while the EU Commission is donating „GoPro“ cameras to monitor the violations. However, it can be assumed that no incriminating images from the action cameras will find their way to the „Monitoring and Advising“ mechanism. This mechanism is toothless, as the German government confirms: Contrary to the Council of Europe’s request, it is a voluntary procedure without sanctions. In one case at the most, the Libyan Navy is said to have had disciplinary consequences. This probably concerns 6 November 2017, when the „Seawatch 3“ was involved and where several people drowned in the chaotic intervention of the Libyan Coast Guard. The Italian National Coordination Centre for Immigration „Roberto-Iavarone“ in Rome with connection to EUROSUR (YouTube). Even without the buildup of the Libyan Coast Guard as Europe’s maritime doorkeeper, it would be avoidable for so many people to drown while fleeing. The European Union is fully monitoring the Central Mediterranean, using both Frontex Border Agency and military missions with high-resolution satellites and the powerful EUROSUR surveillance network. Among other, Frontex processes satellite image material with a resolution of up to 24 cm. The advanced EU Earth Observation Programme Copernicus also controls Libyan coastal regions and the high seas via satellite. However, this information data is still not available to private sea rescue organisations. Image: Frontex control centre in Warsaw (Frontex).